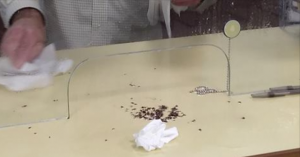 A man, apparently upset that he didn’t qualify for assistance while dealing with a bedbug situation at his apartment, slammed down a cup full of 100 live bedbugs inside a city office. The bugs jumped on at least one employee at Maine’s Augusta City Center during the incident last Friday, according to centralmaine.com. The city offices had to be closed for the day and fumigated. Bedbug-sniffing dogs were to be brought in to root out any stragglers. The man apparently had been dealing with a bedbug infestation at his apartment, and had been told he’d have to vacate. When he went to the city offices to get a form to request general assistance, he reportedly was told he did not qualify for help. “He whipped out a cup full of live bedbugs and slammed it on the counter, and bam, off they flew, maybe 100 of them,” City Manager William Bridgeo told the news site.